In our Shared Windows Servers, you cannot use remote desktop access. However all of our Shared Windows servers provide web-based control panel (SolidCP) to manage your sites online, as well as the option to use Remote IIS management. 3. Click on the website that you want to allow remote management. 4. Click on the Management Tab. 5. 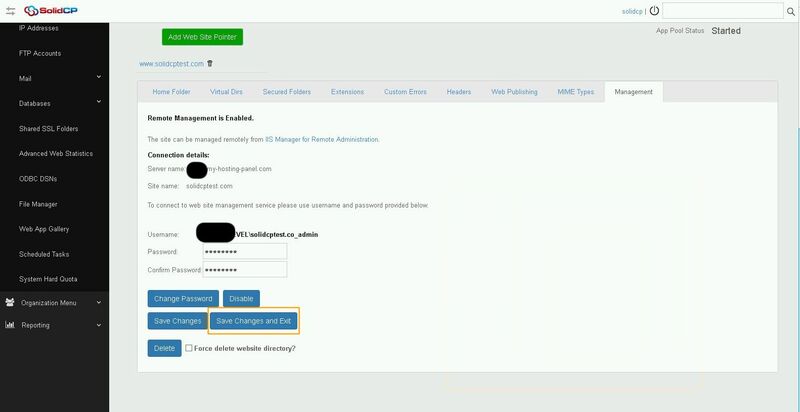 In the Remote Management Section, enter the username and the password of the account that you want to allow to connect remotely. After entering those details, click on Enable. 6. 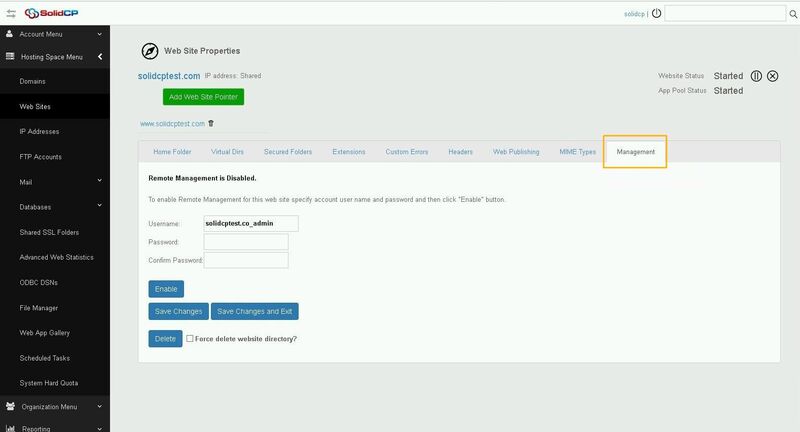 After enabling Remote Management, you will be given the connection details and also the complete username that you are going to use to connect to your hosting space. Click on Save and Exit to fully apply the changes on your website. 1. Download IIS Manager for Remote Administration by clicking here in order to setup the connection to your website. 2. After the installation open the IIS there is a new option of Connect to a site in the Start Page. PS. You need to make sure to choose Connect To a Site opposed to Connect to a Server, as in the Shared server you don't have permissions to the server itself. 3. Click Connect to a Site, type the Site Name / Username / Password received from the previous steps and click Finish.